Jessops announced yesterday it is to cut 550 jobs and close 81 of its 300+ stores. They’re issuing profit warnings due to a fall in the sale of digital cameras. I’m not sure if this is a good or a bad thing for photography in general. Yes it is bad for them but I don’t care about their corporate profits; I’m more concerned about the small independent stores, their profitability and survivial. Closing some of Jessops’ stores may lead to higher profits for the little people. I buy everything I can from Silverprint now, a store in Waterloo that has absolutely everything you could want if you shoot film. They’re not open on the weekend however so there are times where I’ll go to Jessops. It seems a lot of people out there are searching for ‘the sharpest knife in the world’, because that is consistently one of the most common search terms leading to my site. Maybe I should go on a photographic hunt for the ultimate kitchen knife.. Graveyard Cat seems to be the most popular image in my gallery; people are hotlinking it evvverywheeeeeeeeeere. Here it is for those of you not yet besotted with it. 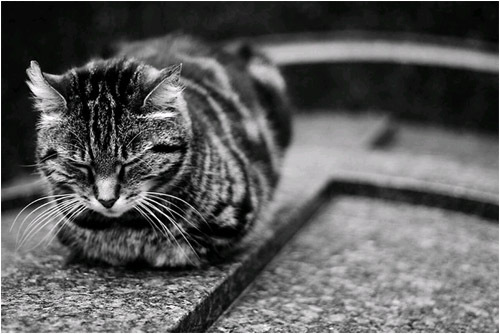 The photo is titled ‘I miss you’, which has lead numerous users on myspace (as well as other places) to leave Graveyard Cat messages to their dear friends. Aah. Anyway I wanted to say thanks to the people who comment on the blog & gallery, the people who link to me and the people who put themselves on the map. The end of this month should be a blast, so expect some interesting blogs and gallery submissions! Everyone seems to be selling digital cameras these days. But not everyone sells the accessories that you can use with said cameras. I’ve bought stuff from Jessops before, albeit online – mostly filters – but all of my camera purchases have been through Amazon, and I’ve bought both the telephoto and wide-angle lenses that I now own via the US. I was a bit annoyed when Jessops stopped stocking 2nd hand equipment , especially in Oxford, as that left no stores that stocked it after the local firm closed down. I hope, as you do, that this will give the local people another chance. Here in HK, the majority of photo shops are indeed little local ones who can compete pretty well with the big chain stores (who are not specialists, but more like Curry’s); this is mainly because of the lack of a firm like Jessops, IMO.